Yeah, I didn't record a video of me drawing it this time. I have a desktop and a notebook, and over the course of drawing I was using both. Recording a timelapse of that would have been a bit tricky, or at the very least would have resulted in some resolution changes. But I was quite happy with it when I was done. Normally when I finish a drawing I have an ambivalence about posting it because I know there's improvements to make, but for this one I was able to call it a day without any grief. This was done in SketchbookPro, and I only used the paintbrush and pencil tools. I didn't want to rely too much on the convenience of tools like airbrush, and instead tried to keep my hand responsible for color selection and application. In some ways, I think it just looks better like that, even if it's less smooth-looking in the end. Also, SketchbookPro doesn't have gradients, so that's not even an option. The program is more or less a digital canvas; it's not Photoshop. I'm completely off of copying others' work at this point; this drawing is all me. But I did have to Google a lot of reference material to remind myself of what Hanako looks like. My memory of her design is only so accurate; I wrote my original review of KS almost 2 years ago after all, and I haven't played it since completing the game. Her hair length, dress style, the shape of her eyes and such had to be researched every now and then while I was drawing. If you're familiar, you'll notice I actually forgot to include her hat. Totally slipped my mind. In addition to not needing something to copy anymore, I'm also getting the hang of adjusting shapes on the fly. See how her shirt folds a little bit because she's turning to the side? A few months ago, I wouldn't have really known how to make it look like that, but this time, I just kind of "did" it. I've just done it enough times to know how, and when I noticed that, I got pretty excited. It's probably the most noticeable milestone reached when doing this drawing; I don't really have any new skills but the ones I do have are automatic now; her hands, hair, eyes, shirt and jacket all got banged out pretty quickly without having to think about them much. A while back I'd commented on how crucial the details in the eyes are, making them very easy to eff up. This time, I had to make very few adjustments to them before I thought they looked right. The jacket was also pretty easy; I found out that there are some areas that need detail (again, eyes), and others that just don't. The jacket only uses a few colors that I placed carefully, and it pretty much looks like it should; I didn't have to do anything extra to it. 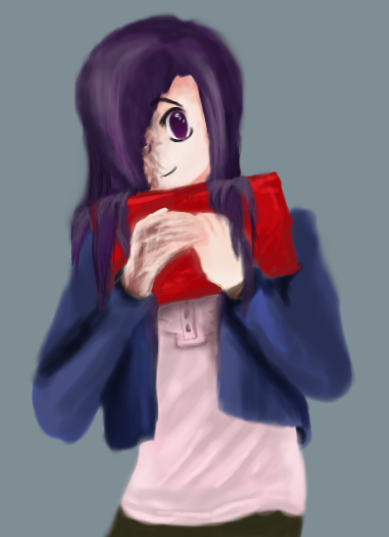 Hanako's a really introverted character with some pretty serious social anxieties. Consequently, you don't really see her smile or laugh that often, but I still didn't want to draw her being sad or scared. Doing that just felt weird. So while it's a bit of a pander to the shy-boy crowd (and not really my thing), I went with an expression I'll call "comfortably embarrassed". I think it works well, and it's about as comfortable as you ever see her. I did have to move the eyes and eyebrows around a few times before I got that right. The mouth too. But all things considered, it's a pretty successful draw, with a few new milestones reached. 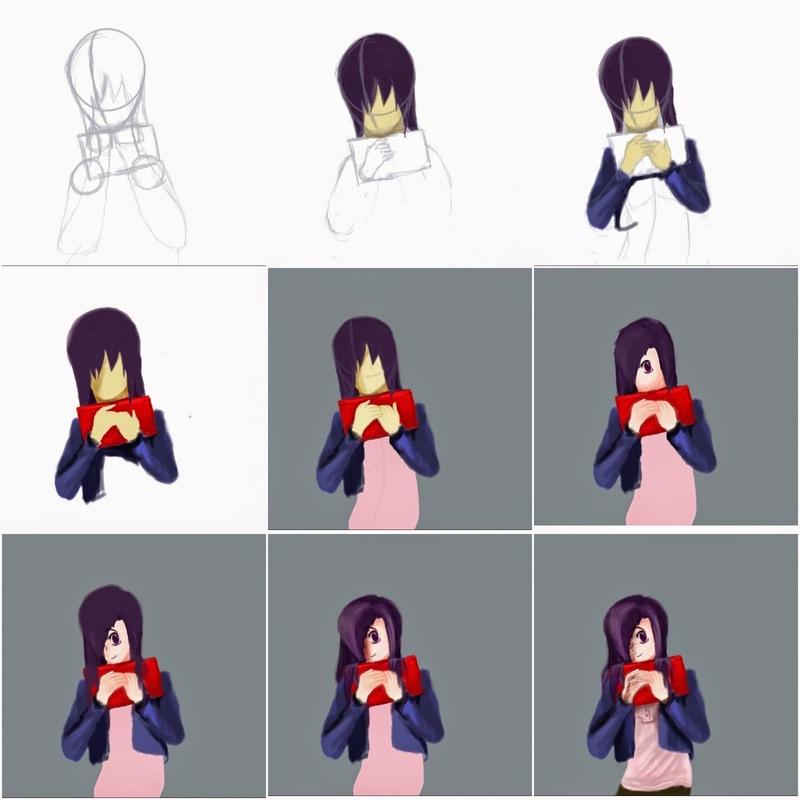 Not sure what's next, but in this series of KS drawings, it'll be Emi (if you were following). After that will be Lily and we should be done, but I'll likely do stuff from other games/shows/whatever in between for both. I'm thinking Emi will be color pencil and Lily will be digital. We're almost there.